June 3 was a bright, sunny day in Spokane, Washington. Pale white wispy clouds floated in the clear blue sky overhead. But not long before noon, a patch of those clouds erupted in wide band of rainbow colors. But it wasn’t really a rainbow at all. John Livingston, a meteorologist at the Spokane National Weather Service, knew this as he gazed at the light show on the horizon just above his house. He knew the characteristic arc was missing and that no rainbow could form if it wasn’t raining. It also wasn’t a sun dog, a common phenomenon that forms a spot of rainbow colors in the sky. He knew what it wasn’t, but couldn’t figure out what it was. Stumped, he called the National Weather Service office, where his fellow meteorologists were equally as puzzled by the colorful sight. Turning to the Internet, they found an answer. The band of shimmering colors hovering over the Spokane skies was a rare type of ice halo called a circumhorizon arc. In the United States, even a vigilant observer might see only one or two a year, according to atmospheric optics expert Les Cowley. Other ice halos, like sun dogs, he said, might be seen every week. Circumhorizon arcs are uncommon because they form only under strict conditions. To create one, the sun must be high in the sky with cirrus clouds beneath it. “Those two things have to come together,” explained Livingston. Cirrus clouds are the thin, feathery clouds that form high in the sky, around four miles up, usually in fair weather. The air at that height is below freezing so the clouds are made of ice crystals. When a circumhorizon arc or any other ice halo forms, the ice crystals act like prisms—refracting the white sunlight as it passes through them to produce a vibrant spectrum of color. 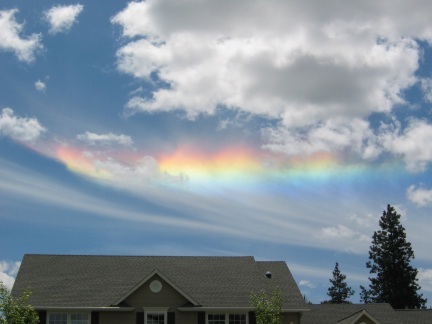 But a circumhorizon arc only forms when the clouds contain a specific, hexagonally shaped ice crystal. For light to enter the cirrus cloud crystals at just the right angle to make a circumhorizon arc, the sun must be at an angle of at least 58 degrees above the horizon. In northern latitudes, the halos are transient—they only last for about an hour. In Spokane, the sun only climbs high enough in the sky around noon; these halos slowly appear a little before noon and then disappear as the sun descends after noon. Even if the angle is right, and the clouds are present, they may not be thick enough to produce a full, wide band of color as was seen in Spokane. If they are too patchy, only fragments of the halo might be visible. I saw a sun dog?? on June 10th (yesterday) I live in Sacramneto. I frequently saw the rainbow colors while living in AZ. Were they sun dogs? Yesteday was the first time I can remember seeing one in CA (native CA). Definately not an ice halo=it was 92 degrees. I never heard of an ice halo until reading your site. Very interesting. A “sun dog” is to the left or right of the sun, a “fire rainbow” is below and potentially much wider than a sun dog. See this site for a graphical explanation of “sun dog” versus “fire rainbow” and other kinds of sky halos.. Yes ive seen a rainbow aura at night spinning around on the outside of a wheel and ball[with a tail]of vapour and gas,the aura was green-like patches it have a cloud of vapour trailing it and it gave off a beam of light when it got over our car roof.An Ophanin the bible calls them, chariots of the seraphin.They like low nimbus clouds so they can make a quick ascension.Now they are RARE! so rare im still in shock 4 years on. I just saw one outside on the sky.Beautiful sight but I did not know what it was. I googled to know what it is and came up with your site. i see partial rainbows all the time where i live, even if theres no clouds in the sky . if you take a video of it and enhance it up the video you can probably see it , its a form of ufo ,its a huge golden rock.a lady in my area saw it come from inside the rainbow and took video of it ,it was on ch 13 news,go on internet to ch 13 news and look it up, seriously. Saw one just yesterday in Wenatchee and it was pretty impressive….larger than this one! I have photos of it…so pretty!